Come for a walk with me down Memory Lane! 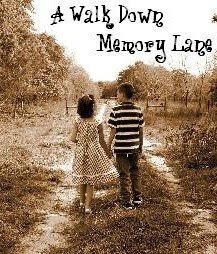 And if you have a "Memory Lane" post, head on over to Scottsville to join in on the fun! This is my horse, Cherokee, and I. This picture was taken in 2006, by my German "bro" Benno. Benno was my parents foreign exchange student at the time, and he wanted me to demonstrate some of my riding skills. 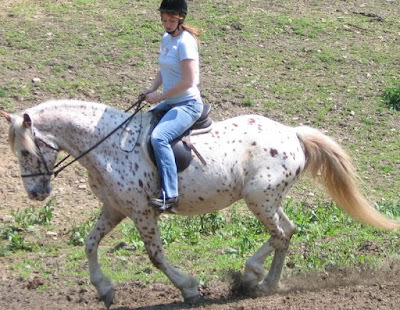 I grew up riding horses, and competed in show jumping, dressage, and Eventing. I no longer compete, nor do I ride often. Sadly, this was my last REAL ride on my horse, where we were actually in training. I was demonstrating to Benno how to do flying lead changes. Why did I stop training? Well, I was actually newly pregnant with Lexie at the time. From that point, the horrible morning sickness and the preterm contractions hit, and I was put on limited activity, and eventually partial bedrest. Then I had a newborn. Then I had a toddler and baby. Then I had a preschooler and a toddler. Time just got away from me, and before I knew it, years had passed. During those years, my horse aged. And now, he's no longer up to the task of the training we once did. That fact makes me sad, but we have some amazing years of training behind us, and a bond that will never break. I love my old man, and I'm so glad that I have that picture of our last day of training together, to look back on! Wow, that was just a few years ago???? At first I thought you mean it was 1996..... but then you said you were pregnant with Lexie. Wow! It's sad that you gave it up, but not surprising. Isn't it funny how our priorities just SHIFT and things that were OUR LIFE get set aside for our new little LIVES? It's hard to find time for anything, isn't is? It hasn't ben all that long, you can surely get back into it. Your old man is beautiful! What a beautiful horse Cherokee is! Lives definitely change after kids! You were the second winner! Check out my latest post for details, and send me your address please ma'am! Ooo I love the breed of horse you had. Polka dots are fun! I am sure that is not the technical term for that:) Thanks for visiting me! Hey, thanks for checking out my blog too! I'm telling you..I could look at your kiddos eyes for hours..SO pretty! Any hoodle..Paige has constant blood in her urine..Drs thought something was wrong with her kidneys..Praise God..ultrasound showed perfectly NORMAL kidneys. YAY!